What’s it like at BeachPoint? What Do Our Guests Say? How Do I Get to Siesta Key? 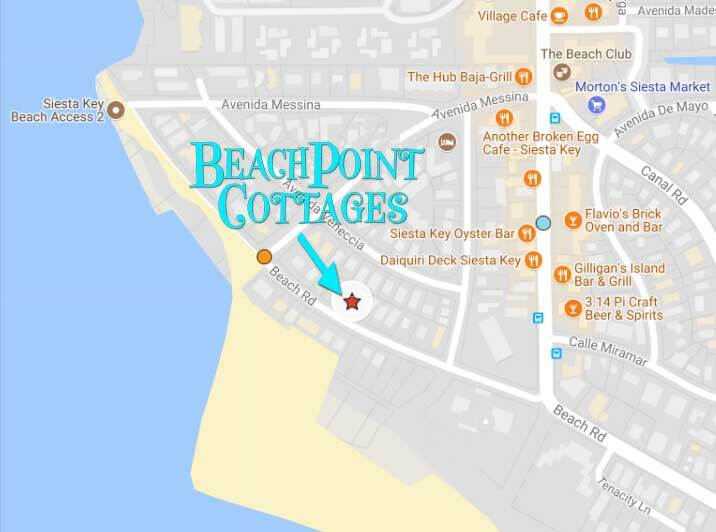 BeachPoint Cottages occupies a prime location within the 3.5 square miles of paradise known as Siesta Key. We are one of the few vacation rental properties on the island with direct access to this very unique and quiet area of the beach. This special beach locale is accessible primarily by foot or bike. Locals gather here in the evenings to watch the spectacular sunsets. 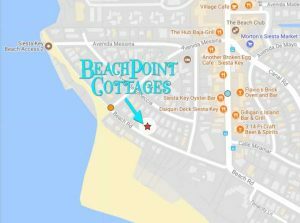 If you are looking for a laid back, less crowded beach for your family vacation – you will love BeachPoint Cottages. Close enough to easily stroll to your cottage for a break or a snack and no parking issues. The cottages are also an easy 2-3 minute stroll from the restaurants and shops of cool Siesta Village. “Unlike beaches elsewhere that are made up mostly of pulverized coral, Siesta Beach’s sand is 99% quartz. Even on the hottest days, the sand is so reflective that it feels cool underfoot. It’s estimated that the sand on Siesta Beach and Crescent Beach on Siesta Key is millions of years old, having its origin in the Appalachians and flowing down the rivers from the mountains until it eventually was deposited on the shores of Siesta Key. Siesta Key is an eight-mile-long barrier island approximately 55 miles south of Tampa, Florida. It sits between Sarasota Bay and the Gulf of Mexico, and is connected to the Sarasota mainland by two bridges. Originally named “Sarasota Key” around 1513, the name changed to “Siesta Key” in the 1920’s. The current population is only approximately 6,500. All the conveniences are easily accessible, but Siesta Key still offers a feeling of old Florida. Locals treasure the pristine beaches with wild sea oats and mangroves providing a protected habitat for native island birds, as well as the dolphins, manatees and other aquatic wildlife living just offshore. BeachPoint provides a welcoming home for native birds, plants, turtles and other wildlife. What airport do you fly into to get to Siesta Key? Hop on the Free Trolley!